tends to be motivated by values which transcend his self. The fully developed (and very fortunate) human being working under the best conditions tends to be motivated by values which transcend his self. They are not selfish anymore in the old sense of that term. Beauty is not within one’s skin nor is justice or order. One can hardly class these desires as selfish in the sense that my desire for food might be. My satisfaction with achieving or allowing justice is not within my own skin; it does not lie along my arteries. It is equally outside and inside: therefore, it has transcended the geographical limitations of the self. 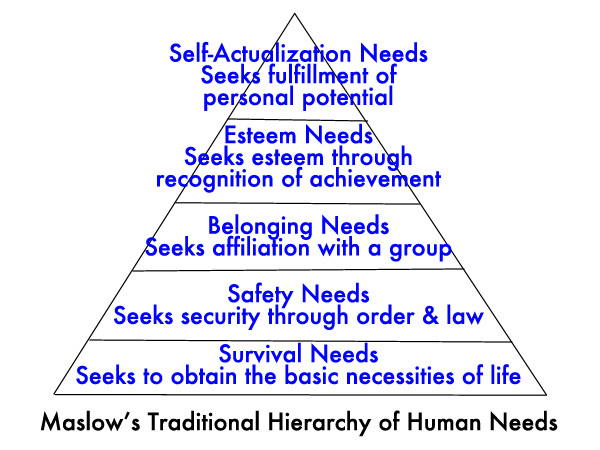 Maslow’s observations indicated that self-actualization is not enough for some people. It is possible to get fixated at self-actualization and to be very content at that stage of development. For others, it is not enough and until they can begin to not just have peak experiences but to live at a level that embraces unitive consciousness as the norm, they are miserable and begin to exhibit what Maslow called “metapathologies” or spiritual-existential ailments. 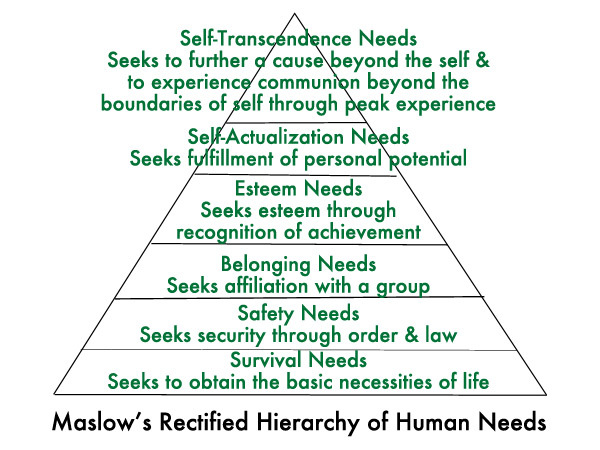 Maslow observed that people can have transcendent or peak experiences at any level of psychological development. How they interpret those experiences will depend on their internal and culture value systems, beliefs, references. This perspective corresponds to the work of his contemporary Clare Graves who identified a series of cultural value systems that move into greater complexity in response to increasingly complex outer circumstances over time. Other psychologists (Kegan, Loevenger, Gilligan) have identified similar development structures that resonate with inner spiritual structures that have been a part of Eastern traditions for centuries. The challenge comes in differentiating spiritual states of experience with psychological stages of development. What Maslow observed was transcendent experiences occurring at multiple levels of psychological development. The important point to be made here is that even though many people seek and achieve peak experiences, they may not have achieved self-actualization. We see this in what Maslow’s contemporary, Clare Graves, calls the “green meme”—in which pluralism and post-modernism can actually delay or abort self-actualization when individuals become fixated on causes without continuing psychological development. Many heroic efforts may take place to fulfill belonging and esteem needs, which can lead to self-actualization. But often what is missing is “shadow work” in which an individual learns to observe his or her conditioned responses and behaviors. A lot of deep psychological growth involves catching one’s self in the act of behaving mechanically. As we become more conscious of our authentic self and increasingly attuned to the tricks of the false self, we can step back and observe even our deepest motivations. It is at that point that we can truly call ourselves self-actualized and it is from that fertile psychological soil that self-transcendence emerge as a stage of personal growth. Because not all self-actualizers are self-transcenders and not all individuals having peak experiences have attained the psychological development level of self-actualization, the real self-transcenders can find it difficult to locate others who share the same intrinsic values such as truth, goodness, beauty, perfection, excellence—which cannot be reduced to anything more ultimate. Maslow came to believe that regular self-actualizers could be content with the fulfillment of their “personal idiosyncratic personalities” without having transcendent experiences. They operate in what he called the D-realm, signified as being subject to “deficiency needs” that make up the traditional Hierarchy of Human Needs. But self-transcenders who are moving beyond self-actualized also need to experience a feeling of unitive consciousness that often manifests as sacralized work that in service to others. The good news is that once self-transcenders become aware of what makes them different from their self-actualizing family, friends, and colleagues, they are more likely to relax, champion their own unique values, and seek out others of like mind without feeling guilty for wanting more in terms of their psycho-social development. ¹ Primary source for this article: Mark E. Koltko-Rivera, “Rediscovering the Later Version of Maslow’s Hierarchy of Needs: Self- Transcendence and Opportunities for Theory, Research, and Unification.” American Psychological Association, Review of General Psychology, 2006, Vol. 10, No. 4, 302-317. ² A. H. Maslow. Cognition of being in the peak-experiences. In A. H. Maslow, Toward a psychology of being (3rd ed., pp. 81-111) New York: Wiley. (Reprinted from Journal of Genetic Psychology, 1959, 94, 43-66). ³A. H. Maslow, “The Farther Reaches of Human Nature,” lecture given at First Unitarian Church, San Francisco, California, September 14, 1967, under the auspices of Esalen Institute, Big Sur, California.